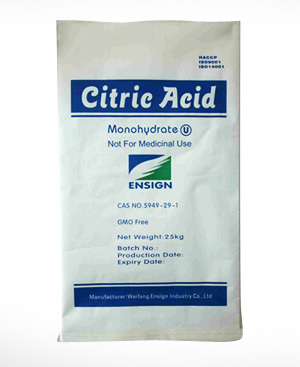 Citric Acid Monohydrate is a weak organic acid. Citric Acid Monohydrate is a natural preservative and is also used to add an acidic, or sour, taste to foods and soft drinks. In biochemistry, Citric Acid Monohydrate is important as an intermediate in the citric acid cycle, and therefore occurs in the metabolism of virtually all living things. Citric Acid Monohydrate can also be used as an environmentally benign cleaning agent. Citric Acid Monohydrate exists in greater than trace amounts in a variety of fruits and vegetables, most notably citrus fruits. Lemons and limes have particularly high concentrations of the acid; it can constitute as much as 8% of the dry weight of these fruits (about 47 g/L in the juices). The concentrations of citric acid in citrus fruits range from 0.005 mol/L for oranges and grapefruits to 0.30 mol/L in lemons and limes. Within species, these values vary depending on the cultivar and the circumstances in which the fruit was grown. The product is in conformity with BP/USP/FCC/E330.